Our domestic high-bush blueberries are beginning to produce although they’re only about two feet tall. The deer nibbled the tops off two years in a row because someone left the gate open. Our Patriot blueberries are the size of the end of my thumb! I picked the ripe ones and added them to those given to me for my birthday by my friends Dara and Robin, and canned them all up yesterday. 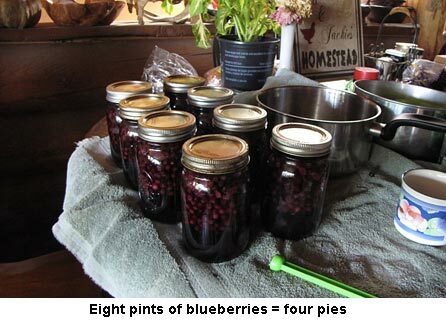 I ended up with eight pints of wonderful blueberries — translates to four big blueberry pies! “I cannot recall the last book that I read that I just thoroughly ENJOYED anywhere near as much as this one. Great characters, quick pace, plenty of action, a good old fashioned western with a twist. THANK YOU SO MUCH! Exposure is everything. Sometimes it is kind of frustrating with 5 star reviews on Amazon for all three Westerns and sales have been kind of dismal; it makes me wonder if anyone reads anymore or if it is just lack of exposure??? Anyway, thanks so much. Folks, don’t forget to ask your local libraries to purchase Jackie’s Westerns (and her other books, too). This will help give her more sales/royalties and bring exposure to her books to many other folks. This will build her readership and a loyal following who purchase her books. It all helps. I have asked my local library to order in all the Jess Hazzard series. (It takes them a while though, they get hundreds of requests but I keep sending in the request regularly). I’ve also gone onto the websites of the libraries in the surrounding small towns and put a suggestion in to purchase the books. Jackie helps us out so much with her wisdom and knowledge, we can help in return this way. We have robins too and yep, they do get a few blueberries, but not as bad as yours do. I think that’s because we have so many wild fruits ripe at the same time; blueberries, juneberries and pincherries. Here’s an easy fix. Make a PVC frame out of 1 1/2 inch PVC and use deer fencing, zip tied onto it. Build the frame large enough you can enter it through a door on one end and walk along both sides of your berry row. Friends did this out of desperation and it really works. If wind threatens to tip it over, you can peg it down with anchoring stakes. 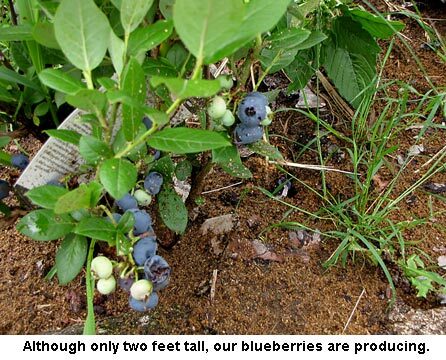 When our blueberry bushes get bigger and more productive, we’ll be doing this as more fruit attracts more birds. But birds ARE good for the homestead as they do keep down many insect pests as well as weed seeds. Joyce, I bought a blow up snake several years ago and have put it in trees, on the ground, in bushes, moved it, etc. and the robins here just laugh. They rip through or go under bird netting. Next year if I want anything to eat I’ll have to wrap the berry bushes with floating row cover and tie it. Haven’t tried the big balloons that have a large eye on them, that’s next. The robins and even finches are crazed when they spot fruit and young vegetables and nothing stops them from feeding. Strawberries are like mind altering drugs to a robin – they will risk anything to get to the berries, ripe or green. They strip every edible thing in my garden. Oh and I tried feeding them too – all that did was create more issues when they told all their friends and everyone produced even more baby robins. Maybe bird seed soaked in bird birth control chemicals?? I wish there were some legal way to cut down the population. Rick I have and have used Tanglefoot – the birds sense it or smell it and won’t go near it. And I’m sure that if I got caught with a robin stuck to a tree branch I’d face either a fine or jail time or both. In regard to pesky birds eating our crops. I read a survival book years ago which advocated spreading tanglefoot on potential roosting places as in barns or buildings or fruit tree limbs in order to catch them. Try bird netting and/or the large blow-up snakes. We have a problem with Blue Jays, Crows and the Robins but the snakes actually work. (The red squirrels don’t like them either) I’ve put them in the peach & cherry trees, the strawberry beds & corn patch & then later move them to the grape vines. They can be a little startling when you come across them – I move them all around the gardens & orchard. I’ve also put cheesecloth over my young blueberry bushes when there are just a few berries to protect. So glad you got to eat your blueberries – I walked out the door to find a robin gulping down the last of the blueberries on my best bush, even the green ones. The robins where I live strip every berry bush and pant and fruit tree bare. Unfortunately they are protected and can’t be shot or poisoned no matter how many there are, and we certainly have an overpopulation. I don’t think there is a government agency that really cares that the robins are eating my winter food supply. I’m so sorry to hear about your wet hay. I don’t know anything more frustrating than putting hay down, based on a good forecast, and then having it drenched. I hope you’ll be able to salvage it. It seems like any time you need rain, just mow down some hay. It’ll be coming as soon as I get a big BHM project finished, which I’m also late on. The book’s finished; I just have to edit it. Miss Jackie, Nice to see the blueberries. We buy them in a 20 lb carton from a farm market which gets them from Michigan and use for jelly, pies, and frozen for breakfasts. Hope the weather holds out for the drying. Those berries look terrific! Thank you for the update Jackie.